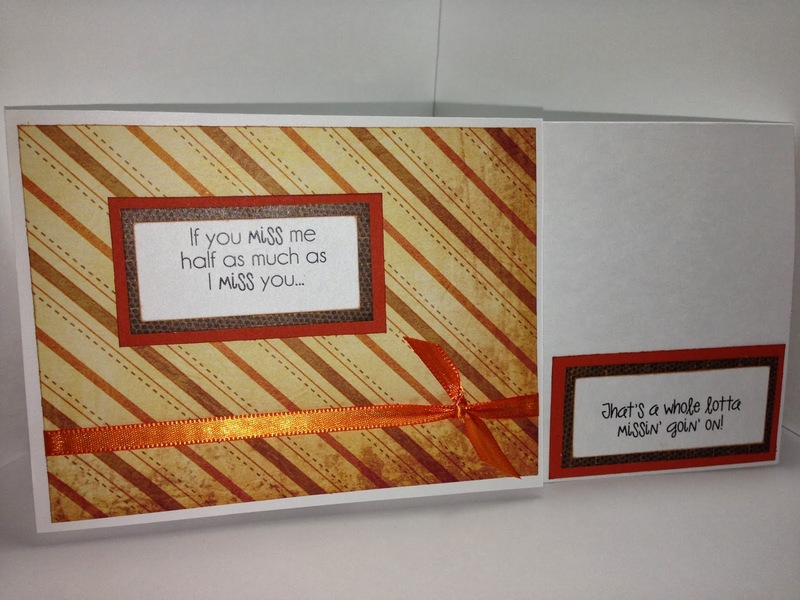 OWH put out a call for missing you cards so I have been working on that theme. I made four different versions of this card - two masculine and two feminine - for a total of 18 cards. These are the standard A2 sized cards but the sentiment comes in two parts so I included the second part on the inside of the card. I hated taking up writing room on the inside but my original idea of putting the second part of the sentiment under a lift flap on the front of the card worked better in my head than it did in reality. I may also try using this sentiment set on a tag that slides out of an envelope attached to the front. This was a much more simple design than I am used to using. I'm trying to push myself out of the over done box I seem to crawl back into all the time! Men's version made with paper from DCWV Rustic Stack and the women's version was made using a paper stack from Colorbok. I also used some paper I picked up on clearance at Hobby Lobby made by The Paper Studio called Football Texture. The solid colors I used were from Core'dinations. I used my ATG for most of the construction and then used Micro Glue Dots to keep the ribbon in place. The sentiment was part of a fundraising package of digis from The Doodle Pantry - www.doodlepantry.com. There are lots of great digis in the package and I also received scads of freebies with my purchase so I'll be trying those out soon.